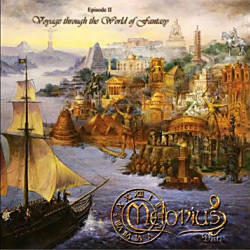 Melodius Deite – Episode II: Voyage Through The World Of Fantasy – Inazuma Productions – Out Now. I’m not familiar with metal from Thailand and was very curious what this would sound like! These guys already had their debut album out in 2008 en last year they released the follow up! Rock N Growl promotion has added this band to their list and sent me the promo for this album. They bring symphonic melodic progressive power metal with great quality. Awesome musicianship can be heard on this album. Especially the orchestration parts are top notch! You can describe their music as a mixture of the early melodic Rhapsody with some snippets of Angra. But their sound is nevertheless unique in its way. The songs are played really fast and let us enjoy incredible catchy riffs and a huge presence of layered keys! The singer Ake N. Keartpanich has a clear voice and visits the higher regions often. The instrumental parts are a treat for the ears and establish the virtuosity of the musicians. Fans of Gloryhammer, Twilight Force and bands from within the same genre will love this complex stuff. It’s an album (a double album to be correct) that requires a huge effort from the listener, so not everybody will find this to be their cup of tea. You have to sit down on your lazy couch and let this music penetrate your brain! For example: the 16 minutes long “Civilization” has an almost five minute intro! But when you dig this stuff, you’re addicted to their complex compositions! “Alexander The Great” is my favourite track from the album. Yngwie Malmsteen is certainly an influence for both axe-men! Just listen to the start and solos of “Pyramide of Egypt”. The album closes with the challenging 13 minutes long instrumental “Sailing Around The World”. The eye-catching artwork is a summary of the different song titles. For doing what they want and believe in, they deserve a great score! I’m going on a quest to find their first album as well!